The book celebrates the work and lives of MOTOElastico ancestors, Cesario Carena, Roberto Pagliero and Giovanni Fornaca: an ongoing adventure that spans over five decades. 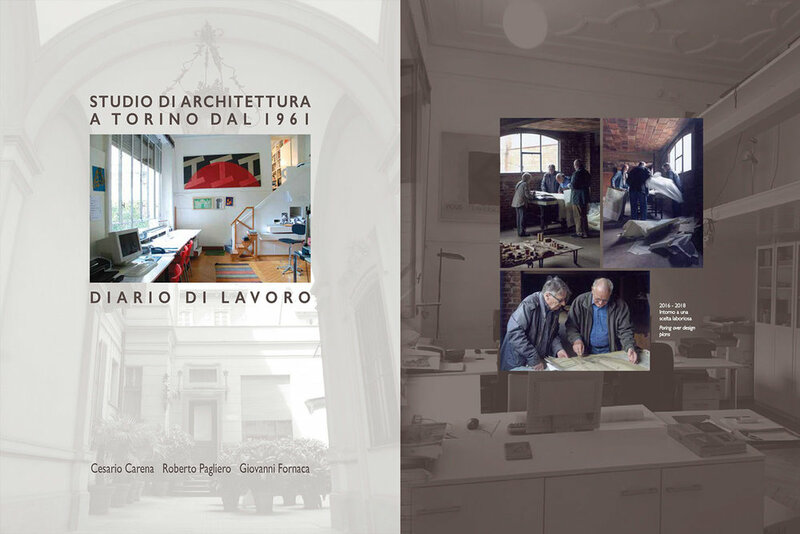 Diario di Lavoro (Work Journal) tells the beautiful story of a diverse group of professionals and of their varied and multiform work, developed since 1961 in the same physical place: the office of Corso Duca degli Abruzzi 14 in Torino. The wide range of commissions completed by the studio, including architecture, interiors, restorations, exhibitions and art projects, were the results of flexible and independent cooperations among the group members: this is probably the secret of such fertile and long lasting relationships. The profession was considered a mission and it was conducted with great enthusiasm. Every project location, Cambiano, Asti, Stromboli, Herat or Seoul was exotic because each place retained its own strong flavor in a world not yet standardized by globalization. As MOTOElastico we are very proud about the opportunity to learn from and work with such fantastic people. Diario di Lavoro is a source of inspiration for our profession, a testimony of great intellectual and physical freedom, a motivation to stay foolish and “modern” in all the things we do. 디아리오 디 라보로, 1961 년 | 이 책은 모토엘라스티코의 조상, 체사리오 카레나, 로베르토 팔리에로와 지오바니 포르나카의 50년을 넘어 지속된 모험의 삶과 작업을 기념한 책이다. 디아리오 디 라보로(작업 일기)는 1961년부터 다양한 전문가 그룹이 동일한 물리적 장소, 토리노의 코르쏘 두카 델리 아브로찌 14 사무실에서 개발한 다양한 형태의 다채로운 작품에 대한 아름다운 이야기를 전한다. 건축, 실내 장식, 복원, 전시회 및 예술 프로젝트를 포함하여 스튜디오에서 완료한 다양한 커미션은 그룹 회원들간의 유연하고 독립적인 협력이 있었기에 가능했다. 이것이 바로 단단하고 오래 지속된 그들의 관계의 비결일 것이다. 직업은 사명으로 여겨졌으며 굉장한 열의를 갖고 수행하였다. 캄비아노, 아스티, 스트롬볼리, 헤랏과 서울 등지에 퍼져있는 모든 프로젝트들은 그 때 당시 아직은 세계화로 표준화되지 않은 장소들로, 각각의 장소는 그 곳만의 고유한 강한 맛을 유지한 상태였기 때문에 이색적이었다. 모토엘라스티코는 이 환상적인 사람들과 함께 일하고 배울 수 있는 기회를 갖을 수 있어서 이를 매우 자랑스럽게 생각한다. 디아리오 디 라보로는 우리 직업에 영감을 주는 원천이고, 지적이고 육체적인 자유에 대한 간증이며, 우리가 하는 모든 일에 우직하고 현대적인 것을 유지하게 만드는 원동력이다. motocompo, the iconic 1981 collapsible Honda mini bike, goes electric and becomes motoEcompo. In the summer of 2016 Simone bought an original Honda motocompo in Daegu. Unfortunately after a short run, the oil pump of the 50cc 2-stroke engine stopped running and spare parts were hard to find: therefore the decision was to abandon petrol and go electric! Two-stroke engines are particularly nasty with the environment, due to the burning of oil-gas mix fuel. Since the motocompo was introduced as a smart mobility solution for commuters, sold by Honda to fit the City car and used for the “last-mile” commute, an electric conversion would celebrate the roots for the new standards of ecology. Recycling the valuable retro-design with a contemporary 48 volt, power unit. Less tar, Same flavor! The project started with the stripping of the bike, revealing the beautiful proportions and smart solutions, removing all combustion-engine parts and proceeding with the modification of the original chassis in order to accommodate batteries and a new in-wheel power unit. The new functioning EV motoEcompo, is currently on display at the Coffee Society exhibition at Culture Station 284 in Seoul. The motoEcompo is a project led by Simone Carena, developed for the IDAS SDE Ecology & Sustainable Design Class, with the support of the "Design Engineering Postgraduate Schools" program, a R&D project initiated by the Ministry of Trade, Industry and Energy of the Republic of Korea. 1981년에 판매되었던 혼다의 상징적인 접이식 미니 바이크가 전동화 개조 작업을 거쳐 모토E콤포로 재탄생되었다. 2016 년 여름 시모네는 대구에서 혼다 모토콤포 오리지널을 구입하였다.불행히도 단기간 사용 후, 50cc 2행정 엔진의 오일 펌프가 작동을 멈추었고, 예비 부품은 찾기가 어려웠다. 때문에 가솔린을 버리고 전기를 사용하기로 결정했다! 2행정기관은 혼합 연료의 연소로 인해 특히나 환경에 매우 좋지 않다. 혼다 시티 자동차에 넣어넣고 다닐 수 있어서, 주차 후 마지막 남은 거리를 타고 다닐 수 있도록 설계되었던 모토콤포는 이 특징으로 인해 애초부터 통근자들을 위한 스마트 이동 솔루션으로 소개되었다. 이 점을 감안했을 때 모토콤포를 전동화하는 작업은 생태에 대한 현대적인 기준에도 맞을 뿐 더러, 모토콤포의 아름다운 디자인은 물론 그 뿌리를 기리는 일이었다. 귀중한 복고풍 디자인을 최신 48 볼트 전원 장치로 재활용한 것이다. 타르는 덜었지만, 그 맛은 똑같다! 이 프로젝트는 바이크를 벗겨내는 작업부터 시작하였다. 아름다운 비율과 스마트한 솔루션들을 확인할 수 있었고,모든 연소 엔진 부품을 제거하고 배터리와 전기 구동부가 내장된 새로운 바퀴를 탑재하기 위해 기존의 차대를 수정하는 작업을 진행하였다. 새로이 작동하는 EV 모토E콤포는 현재 문화역서울284에서 진행되는 전시 “커피사회”에서 ‘모토엑스프레스’ 전시의 일부로 활용되고 있어, 그 실물을 확인할 수 있다. “Home far from Home” is the title of the long interview between Italian journalist Renato Rizzo, and MOTOElastico. 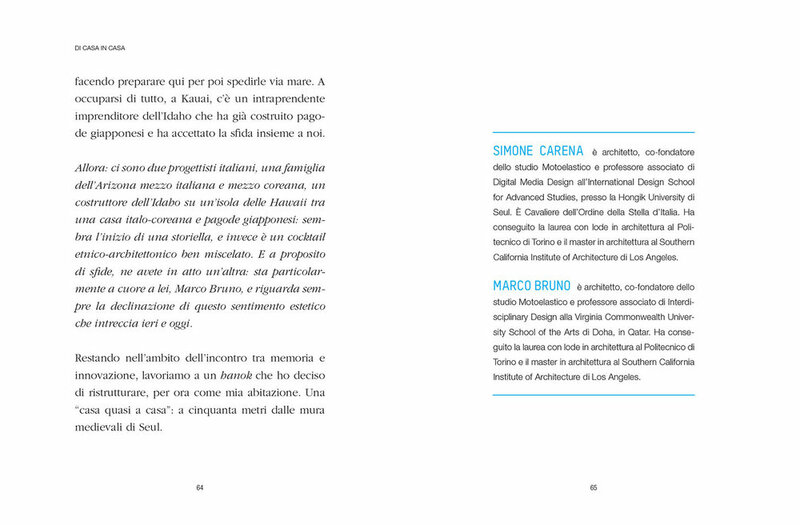 The interview is featured in the book “Di Casa in Casa”, a project by Zumagalli & Gallina SPA, published in Italy by Codice Edizioni. 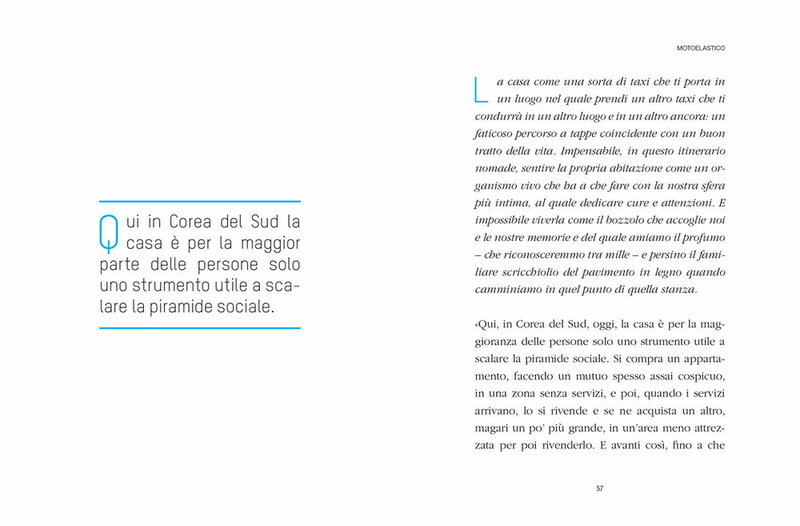 Di Casa in Casa (From one house to another) is an interview-book where people with different backgrounds describe what dwelling means to them. 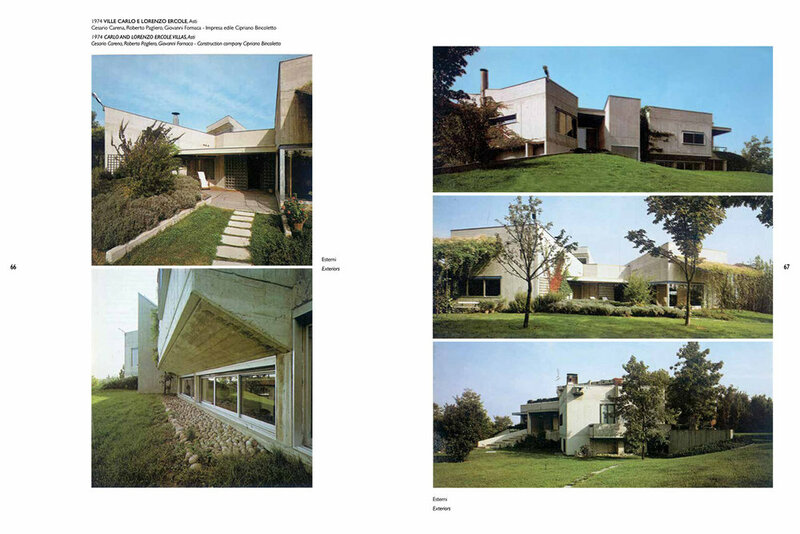 “A Home is a sentimental sculpture, a prism with many faces, embodying memories and emotions. This book puts the home on the couch of a great psychoanalyst, tells its story through the memories of a war correspondent, discovers its “Korean” side through the projects of two architects. It looks at it through the eyes of a sociologist, the raw images of a urban photographer, the experiences of a man of peace. While a dwelling guru explains to us how to do “couch surfing” and a tech guy opens for us rooms full of butler-robots.” (from the book cover). Thanks to Azelia Gallina, and all her company, for the open-minded vision, to Renato Rizzo for his brilliant synthesis, to Raffaella Lecchi for the empathic curatorship and to Fabio Sorano for the slick graphic. "집과 멀리 떨어진 집 (Home far from home)"은 이탈리아 기자 레나토 리쪼와 모토엘라스티코 간의 긴 인터뷰 제목이다. 이 인터뷰는 이탈리아 Codice Edizioni 출판의 Casa의 Di Casa에 실려있으며, 이 서적은 Zumagalli & Gallina SPA의 프로젝트이다. 아젤리아 갈리나와 그녀의 열린 비전의 기업, 르나토 리쪼와 그의 화려한 합성물, 공감적인 큐레이터 라파엘라 레끼, 그리고 매끄러운 그래픽 작업을 한 파비오 쏘라노에게 감사의 말을 남긴다. If people don’t go to the café, the café goes to the people: and it uses a motorcycle to reach them. For the Winter Club Coffee Exhibition, MOTOElastico is presenting a movable coffee unit that will offer free coffee and a chit chat space in front of Culture Station Seoul 284. Contemporary culture puts people constantly on the move and there is very little time left for social interaction around a cup of coffee. We want to put interaction back at the center of the coffee experience. The MOTOEXpress is a mobile unit that delivers coffee, but most of all delivers coffee space. It is an itinerant café, a light train convoy with two seating/serving units pulled by an electrified Motocompo, the iconic folding bike produced by Honda. Come and have a coffee with us! 사람들이 카페에 가지 않으면 카페가 사람들을 찾아간다: 그리고 이때 오토바이를 사용해 사람들을 찾아간다. 커피사회 전시 작가로 참여한 모토엘라스티코는 문화역서울284 광장에서 무료 커피를 나눠주고 사람들과 담소를 나눌 수 있는 이동식 커피유닛을 선보인다. 현대인들을 끊임없이 움직인다. 이러한 문화는 커피 한 잔을 놓고 사회적 상호작용을 할 시간조차 허락하지 않는다. 모토엑스프레스는 커피 체험의 핵심을 사회작용에 두려고 한다. 모토엑스프레스는 모바일 장치로 커피를 제공하지만 그보다 더 중요한 것은 바로 커피 공간을 제공한다는 점이다. 모토엑스프레스는 커피를 제공하는 공간과 마시는 공간, 두 유닛으로 이루어져있다. 순회하는 카페로, 개조된 전동모토콤포가 이끄는 열차 호송 차량이다. 오셔서 우리와 함께 커피 한 잔 하실래요? 개 막 식 2018년 12월 20일 오후 5시 / 전시기간 2018년 12월 21일 - 2월 17일 / 장 소 문화역서울284 / 전시회에 대한 자세한 내용은 여기를 클릭하십시오. MOTOElastico is presenting three chess boards at Crack The Average, an exhibition exploring strategies and artifacts that are critically challenging the uniformity of Korean urban culture. The Chess Boards include the original piece produced in 2007 that represents the battle of Landmarks between two areas of Seoul, the traditional north versus the rampant south. The new pieces, The Dame Apartment Wars and the Average Laser-cut Chess offer a commentary on the current state of Korean real estate: a social game that tends to absorb, in a unified environment, all kinds of protruding differences. 모토엘라스티코는 전시 평균의 균열에서 3개의 체스 보드를 선보이고 있다. 평균의 균열은 한국의 획일적인 도시 문화에 도전하는 전략과 도구를 전시회다. 3개의 체스 보드 중 하나는 2007년에 제작된 원작으로, 서울의 두 지역, 즉 전통적인 북쪽과 걷잡을 수 없는 남쪽의 랜드마크전을 상징한다. 새로운 작품인 체커 아파트 전쟁과 평균 레이저 커팅 체스는 현재 한국 부동산의 실태에 대한 견해를 보여준다. 통합된 환경에서 모든 종류의 돌출된 차이를 흡수하는 경향이있는 사회적 게임이다. 이 전시회는 2018 년 10 월 18 일부터 27 일까지 서교동 예술공간 의식주에서 진행된다. 전시회에 대한 자세한 내용은 여기를 클릭하십시오. The Scroll is the main pavilion of the newly open Hangang Art Park, an open air collection that includes 37 art pieces curated by Eun Byungsoo and his team. 이번에 새로 개막한 한강예술공원은 총 37개의 작품으로 구성되어있으며, 은병수 총감독과 한강예술공원 프로젝트팀에 의해 기획되었다. 스크롤은 한강예술공원의 주 파빌리온이다. “서울 시내를 가로지르는 한강은 그 주변에 생명과 번영을 가져다준다. 우리는 그 관대함을 기리기 위해 한강의 흐름을 기념비적인 두루마리에 기록하였다. 스크롤은 동쪽에서 서쪽으로 흐르는 물의 에너지를 담은 나선형의 플랫폼이다. Scroll Pavilion(스크롤 파빌리온)은 한강의 주요 랜드마크가 새겨진 말아올린 눈금자로, 그 총 길이는 90미터에 달한다. 스크롤은 거대한 미니어쳐인 샘이다. 방문객들은 앉아서 휴식을 취하거나 스크롤을 거닐 수 있다. 스크롤은 2018년 8월 25일 대중에게 오픈된다. 한강예술공원에 대한 더 자세한 내용은 여기를 클릭하세요. 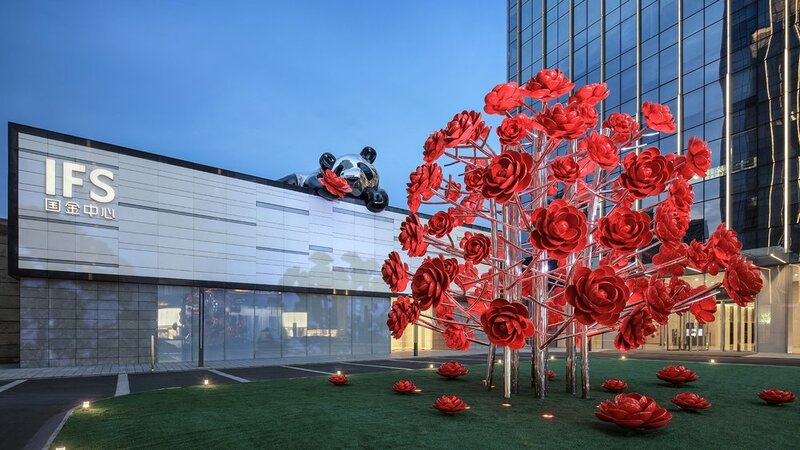 LOVE.FOUND, a permanent Public Art installation commissioned by the Chongqing IFS Mall 重庆国金中心, was inaugurated on August 11, 2018. The project was driven by Simone Carena for MOTOElastico in collaboration with artist Yihong Hsu. A giant Panda holding a red camellia, the flower symbol of Chongqing, was installed on the roof of the recently open IFS Mall. The Panda is made of stainless steel, is 12 meters long and weighs 7 tons. It was fabricated in Dongguan, 1.380 km away from Chongqing, divided into 7 pieces, loaded onto several tracks and re-assembled on site. Thanks to CQIFS Yesi Su Fong Kwee and her team for the amazing coordination of the opening event. Special thanks to Christina Hau, General Manager at Wharf and to Filippo Nicosia, Italian Consul General in Chongqing who joined the unveiling celebrations with Superstar Show Lo 罗志祥 ! 충칭 IFS Mall 重庆 国金 中心이 의뢰한 영구 공공 아트 설치물 LOVE.FOUND는 2018 년 8 월 11 일에 개장하였다. 이 프로젝트는 예술가 이홍 수 (Yihong Hsu)와 모토엘라스티코의 시모네 카레나가 공동으로 진행하였다. 충칭의 상징인 붉은 동백꽃을 들고 있는 거대한 팬더가 최근 열린 IFS Mall의 옥상에 설치되었다. 팬더는 스테인리스 스틸로 만들어졌으며 길이는 12 미터, 무게는 7톤에 달한다. 충칭에서 1.380km 떨어진 둥관에서 제작되어 7개로 조각으로 나뉘어 트럭 여러 대에 적재되어 현장에서 재 조립되었다. 오프닝 이벤트를 멋지게 진행해준 CQIFS Yesi Su Fong Kwee와 그녀의 팀에게 감사드리며, 슈퍼스타 Show Lo 罗志祥와 함께 축하행사의 베일을 벗겨준 Wharf의 총책임자인 Christina Hau와 이탈리아 총영사인 Filippo Nicosia에게도 감사의 말씀을 전합니다! 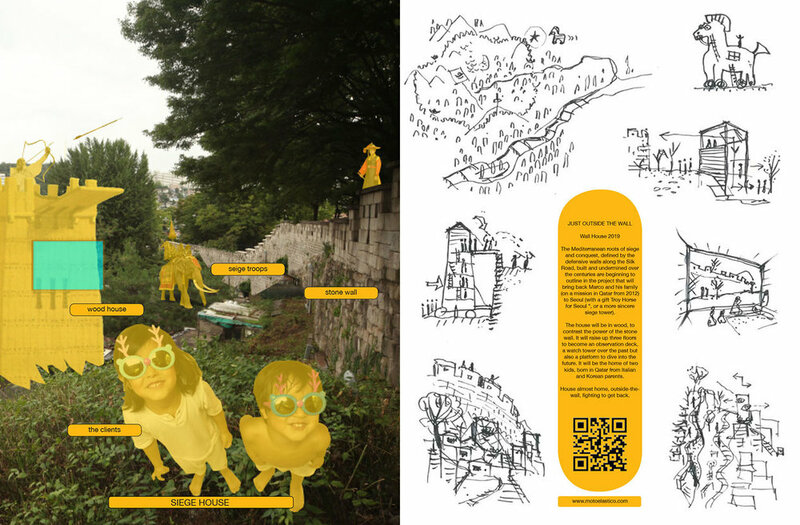 :Playtime is the first international festival in Vietnam dedicated to making our city more livable and fostering discussion on the need for vibrant and varied public spaces. With the participation of award-winning architects and urbanists from around the globe, we will connect Ho Chi Minh City to a network of pioneering cities that promote the local street-life and provide citizens with playful tools to improve their daily lives. 2018 년 7 월 26 일 Playtime(플레이타임)에서 시모네 카레나와 마르코 브르노를 워크숍 리더 초청연사로 만나세요! : Playtime은 우리 도시를 보다 살기 좋은 곳으로 만들고 활기차고 다양한 공공장소의 필요성에 대한 토론을 촉진하기 위해 베트남에서 최초로 개최는 국제 축제입니다. 수상 경력에 빛나는 건축가와 도시 전문가의 참여로, 지역 거리의 삶을 알리고 일상 생활을 개선해 줄 재미난 도구를 제공하는 개척도시 네트워크에 호치민시를 연결합니다. Simone Carena will be representing MOTOElastico at the Social Innovation Conference, in Seoul City Hall, on the 18th and 19th of November 2015. Our office is partnered with Dongdaemun Rooftop Paradise for this event. The future of Seoul is shaping up ! 2015년 12월 18, 19 양일간 서울시청에서 열리는 사회혁신 컨퍼런스에 시모네 카레나가 모토엘라스티코를 대표해 발표합니다. 이 이벤트는 모토엘라스티코와 동대문 옥상낙원이 함께 합니다. 더 나아질 서울의 미래를 확인하세요! We have a booth at Design Korea, in the Italian pavilion. Drop by to get some Mototjaris, Motobags, Mototes and some books. 모토엘라스티코는 지금 디자인코리아 이탈리아 파빌리온에 참여중입니다. 들러서 모톳자리, 모토백, 모토트 그리고 서적을 만나보세요. The Mototjari will be presented at the 2015 Gwangju Design Biennale. Our booth will detail its history, from the partnership with IDAS school at the 2014 Biennale di Venezia to the 2015 Seoul Living Design Fair. The exhibition starts the 15th of October and will stay there for 1 month. Be sure to check it out ! 2015 광주 디자인 비엔날레에서 모톳자리를 만나보실 수 있습니다. IDAS와 함께 한 2014 베니스 비엔날레에서부터 2015 서울리빙 디자인페어 까지 모토엘라스티코의 부스에서 그 역사를 확인 하실 수 있습니다. 10월 15일부터 1 달간 전시가 진행될 예정이니 놓치지 마세요! The official MOTOTJARI PARTY will happen this Wednesday 23rd of September, starting at 8pm, at La Bodeguita, in Chungmuro. Please come and bring your friends ! The more the merrier ! During the event, you will be able to buy any of our products and have a drink with the designing team! 공식 모톳자리 파티가 9월 23일 수요일, 8시부터 충무로의 La Bodeguita에서 열립니다. 많을수록 신나는 파티! 친구와 함께 꼭 들러주세요! 이벤트가 진행되는 동안, 모토엘라스티코의 모든 제품을 구입하실 수 있으며, 디자인 팀과 함께 주류를 즐기실 수 있습니다! We'll be selling Mototjaris this Friday and Saturday at the Dongdaemun Design Plaza Night Market. Swing by if you want to be one of the first to get some MOTOElastico fashion-wear. 이번주 금, 토 이틀간 동대문 디자인 플라자(ddp)야간장에서 모톳자리를 판매합니다. 모토엘라스티코의 첫 번째 패션아이템을 원한다면 놓치지 마세요. Crow's Eye View exhibition in New York, Borrowed City Lecture at RISD Providence, Mototjari at the Night Design Market in Seoul, Borrowed City 2 Launching Party at The Bodeguita, Mototjari available at VCUQ Store in Doha. 뉴욕의 Crow 's Eye View 전시회, Borrowed City RISD Providence에서의 강연, 서울의 야간 디자인 시장에서의 Mototjari, Borrowed City 2 도하의 VCUQ 스토어에서 판매되는 Bodeguita, Mototjari에서의 시작 파티가 있습니다. Our new website is online ! We hope you like the cool GIFs we made ! 새로운 홈페이지가 오픈하였습니다! 우리가 만든 멋진 GIF 이미지들이 당신의 마음에 들었으면 좋겠어요! The MOTOTJARI collection is out ! The Mototjari, the Motobag and the Motote are all freshly released. You can buy them online through this website, or buy it at one of our events. - 09/23 Mototjari Party !